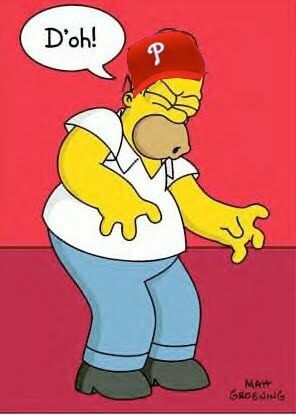 With confirmation coming from Phillies manager Charlie Manuel that the Phillies' pitching rotation in the next round of the playoffs will remain the same as is was in the Division Series against Cincinnati, a famous exclamation from TV character Homer Simpson may be what the Giants will be saying once the National League Championship Series begins. The Phillies' big trio of pitchers- Doc, Oswalt and Hamels will set out to continue their dominance that they've displayed since Oswalt joined the Phillies in late July. Since the Phillies acquired Oswalt from Houston on July 29th, the "D'oh!" inducing trio have troubled their opponents, posting a combined 23-7 record with a 2.23 ERA, 248 strike outs and 48 walks in 262 innings pitched (39 games). Combined in 21 career postseason games, "Doc" Halladay, Roy Oswalt and Cole Hamels have posted an 11-3 record with a 3.31 ERA. In those games, they've struck out 106 batters while walking just 38 in 130 1/3 innings pitched. Manuel is expected to use Joe Blanton as the Phillies' 4th starter. However, if the Phillies trail in the series, headed into game 4, it is likely that the Phillies would use Halladay on short rest. Blanton has been strong over the same stretch in which his staff mates have shined. In his last 13 games of the regular season, Blanton posted a 5-0 record with a 3.45 ERA. In Blanton's last 12 starts, the Phillies went 10-2. With so much focus on the Phillies' hurlers, the Giants' starting staff should not be overlooked. Their starting pitchers, Tim Lincecum, Jonathan Sanchez, Matt Cain and Madison Bumgarner combined for a 2-0 record with a 0.93 ERA in 4 games of the NLDS against the Braves. So, while the Giants' offense could struggle and be pressed toward quoting Homer Simpson, it could also be the Phillies' lineup that faces a frustrating batch of pitchers that have them uttering expressive catch phrases in disappointment.